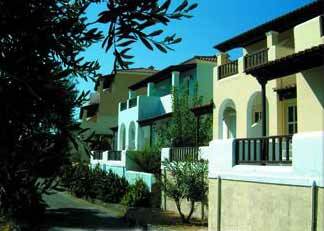 Corfu Village is an A class Hotel with a capacity of 180 beds, situated only at 17 km. south of Corfu Town in Saint Joannis-Village between Moraitica and Benitses. Built in 1992, Corfu Village offers a unique summer resort for friendly and warm relaxation, with it's main air-conditioning restaurant, disco-bar, roof-bar,Satelite T.V. lounge, pool bar and a large fresh water swimming pool as well as children's pool. All bungalows have a panoramic view to the sea with large balconies, big bathrooms, two channel music, a direct dial telephone, refrigerator and Air Condition The Hοtel is designed and built with a special care to preserve nature and the architectural colour and style of the island. Είστε ιδιοκτήτης ή διευθυντής στο CORFU VILLAGE; Εγγραφείτε τώρα για δωρεάν εργαλεία, που μπορείτε να χρησιμοποιήσετε για να βελτιώσετε την καταχώρησή σας και να συνδέσετε την ιστοσελίδα σας και το σύστημα κρατήσεών σας.